We all have those moments when we get bored with our current project, our eyes get tired, or we just have the intensifying urge to scream and throw the computer out the window. (Please tell me I’m not the only one.) 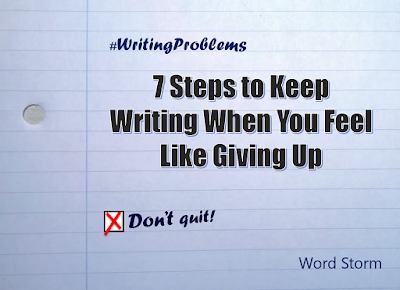 Sometimes we reach a point—whether or not it’s burnout—when we just want to quit writing. It’s hard work. One word after another. And it seems like all the ideas are too hard, too unoriginal, too dry. Whatever the reason, we can all grow tired even of something we enjoy doing. I love writing. But some days I feel like quitting. Recently, I’ve been working on my dissertation for my MA in English Literature, and as much as I enjoy reading, I’m sick of working on this project through the summer when most of my family and friends are on vacation. Now everybody’s getting ready to head back to school, and I’m still working on my dissertation. But over the years, I’ve found several methods to help me get through it all. Here are just a few that have helped. Whether it’s 1,000 words or 100, setting goals for each day, each week can help you make them. 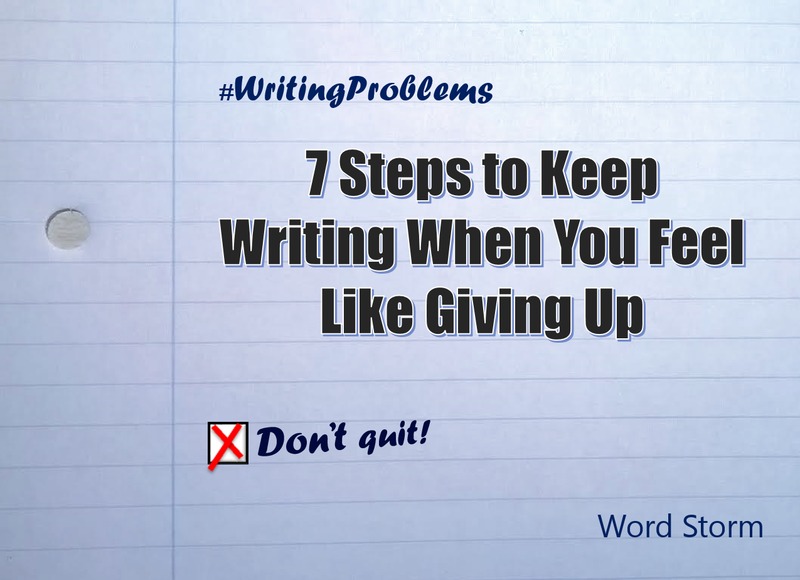 Projects like NaNoWriMo give you a set quota for the day based on your final word count goal. Make sure you set achievable goals, like don’t strive for 5,000 words a day if you can barely write 2,000 usually. You can work up to that instead. Every bit of progress counts. Even if you don’t make your quota for the day, don’t beat yourself up. There’s always tomorrow. (Unless that’s the deadline, in which case, CHUG COFFEE). If you tell people what you’re working on, you’re more likely to receive encouragement than if you keep your writing project secret. This isn’t to say that you have to share every last word as you go, but friends are a great way to keep you going. Back in July, when I was spending the month with my friend Faith, I’d spend the morning writing my dissertation, and when I finished my goal for the day, Faith would cheer me on, even if I thought my writing was complete crap. Thank you, Faith! 3) Set aside time and space. Know what writing environment works for you and stick to it. Set aside certain spots for writing and relaxation. For example, in England, I wrote in my room or at the library and spent all my relaxation time outdoors. At home, I worked on my dissertation in the living room but read or wrote for fun on the balcony or in my room. This allowed me to separate my work space from my relaxation space, and believe me, it’s helped my mental health. As for time, it’s good to know when you focus best. For writing, I focus best in the morning and the evening after dinner. I cannot for the life of me write in mid-afternoon. But I can edit anytime. Knowing what time works best for you can help optimize your performance and help you meet your goals. Often times, the best way to do something you don’t want to do is to just do it. If you don’t want to write, just write. It may not sound like much fun when you think about it, but if all you do is think, you’ll never get anywhere. If you want to make progress, go out there and make it. Just thinking about it won’t get you anywhere. Back when I was studying for exams and doing homework, I used to study for 45 minutes and take a 5-10 minute Pinterest or Facebook break. This works well for writing too. Now, I like to put on a movie soundtrack and work until the last song. Then I’ll take a short break. Your brain can get tired of work, especially when you’re bored. But be careful not to take a break before your allotted time, and if you’re on a role when you reach the end of your set time, keep going! 45 minutes is a great time period to work with short, 5-10 minute breaks so you don’t lose concentration. Repeat the process and take 15-minute breaks every other hour. Whether it’s with an enjoyable walk, a TV episode, or a bowl of ice cream, treat yourself after you make your quota for the day. Back in my undergrad days, I used to reward myself with a chapter for fun after 45 minutes of studying. Lately, that hasn’t worked because I’d end up reading half the book for fun instead. Now I have go for a nice long bike ride or have a bowl of Reese’s peanut butter ice cream. Tell me you wouldn’t work on homework for ice cream. 7) Remember why you started. Did you start writing for fun? For the joy of discovering what you believe? For school? For work? Whatever your reason, reminding yourself why you started writing can help you keep writing. For my dissertation, I could keep telling myself I that if I don’t write the thing I’ll fail my MA, but how encouraging is that? Instead, it’s helpful to remind myself why I picked The Faerie Queene and Paradise Lost to write on—because I enjoyed reading them and I wanted to learn more! Having a mission statement works great. But if you’re on a tight deadline, don’t feel like you have to write one out. Finally, I’m thinking about starting a newsletter for all my lovely followers. If you’re even remotely interesting in receiving more direct updates, please fill out the following 10-question survey. Thanks! Have there been any circumstances when you felt like giving up? Which of the above tips have helped you? Do you have any helpful tips for meeting your goals? Outstanding and very sage counsel!